The Santa Claus Museum & Village and Team H-A-P-P-Y of Spencer County Relay for Life invite you to take a trip back to the 1920s and help solve a murder (while eating wonderful food and enjoying locally brewed beverages of course). Jest Mysteries, a group of professional actors from St. Louis, MO, will put on a lively performance of “Bullets in the Bathtub”, a murder mystery set in the 1920s. Gangsters are showing up at “Cherry’s Speakeasy” to talk about the turf war between the Corneolis and the Buttafuccos. Just when things are going to settle down, in comes a Russian mobster. He sure does know how to make enemies…deadly ones! 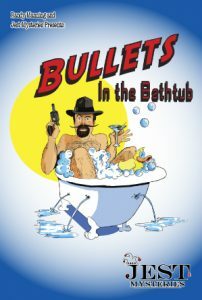 The local constable, Doyle Lonnegan, will come and solve the crime, but not before things get pretty wild. Audience members will all play a part in this entertaining performance so don’t forget to wear your gangster hat and suit, or flapper dress and feather boa. 1920s attire is a must! The event will be held at the Sisters of St. Benedict of Ferdinand Monastery Event Hall. Doors open at 6 pm CT.
Dinner will be catered by The Mill House. A cash bar will be provided by St. Benedict’s Brewworks and Monkey Hollow Winery. Tickets are $50 per person. All proceeds benefit Santa’s Elves and Team H-A-P-P-Y of Spencer County Relay for Life. Please email elf@santaclausmuseum.org if you’re interested in attending. Updates and more information can be found at: https://www.facebook.com/events/224524751305573/. I have always wanted to do this, it sounds like so much fun! Hello! Please send an email to elf@santaclausmuseum.org and we can coordinate from there. Thanks!